With superbly coordinated CNC technology and a wide range of accessories DATRON provides first-class machining results in the production of individual 3D shapes. In the latest DATRON “CNC Project” video, the DATRON M8Cube demonstrates its capabilities in the example of an aluminum thermo mold. Mühltal, 18.05.2017 - Especially blister packages used in the very demanding medical and food industries have to meet high quality standards. Precise pockets, a high surface quality and micro-bores are among the basic features of the respective molds. 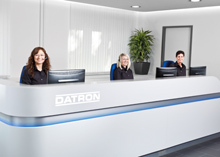 The mechanical engineering company DATRON AG provides suitable product solutions for individual requirements with its diverse product portfolio and high-quality accessories. In the latest DATRON “CNC Project” video, the DATRON M8Cube demonstrates its capabilities in the example of an aluminum thermo mold. 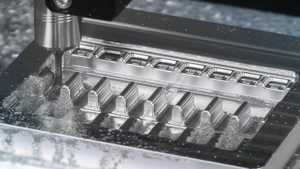 Thanks to high speeds and the use of special tools with small diameters, the universal milling technology achieves optimum surface quality and burr-free edges. Due to the contour smoothing functionality PerfectCut, which DATRON optionally offers for its other machine types, in combination with the minimum quantity cooling with ethanol, 3D surfaces are created that need no post-machining. DATRON milling machines are extremely productive due to their flexibility and simple adaptation possibilities, for example by fast and safe clamping of the raw material with the pneumatic DATRON short-stroke clamping element. Besides, they are especially economical for small as well as for large batches and changing sizes.